Nabeel Rajab, a prominent Bahraini human rights activist and Index award winner, has been detained for seven days while being investigated for claims that he offended the Ministry of Interior over Twitter. Index CEO Jodie Ginsberg said: “Index is deeply concerned that the UK government has done little to press Bahrain to improve its human rights record. Instead the UK talks repeatedly of improvements in the human rights system in Bahrain when it is clear that rights such as freedom of expression are not being respected.” Index is writing to UK MPs to raise the case of Rajab. On 1 October, Rajab, president of the Bahrain Centre for Human Rights (BCHR) and director of the Gulf Centre for Human Right (GCHR), was summoned by the cyber crimes unit of the Criminal Investigation Directorate. He is alleged to have “denigrated government institutions” on Twitter, according to the Ministry of Interior. Rajab was released in May after two years in prison on charges including making offensive tweets and taking part in illegal protests. Rajab “has been targeted with repeated arrest and detention because of his work in the field of human rights” and “the government’s aim is to hinder his advocacy work both inside and outside of Bahrain”, said BCHR, Americans for Democracy and Human Rights in Bahrain (ADHRB) and the Bahrain Institute for Rights and Democracy (BIRD). The arrest came shortly after Rajab’s return to Bahrain following an international trip to raise awareness of human rights violations in his country. He was calling for the release of human rights activists — and father and daughter — Maryam and Abdulhadi Al-Khawaja. Maryam has since been released on bail, her travel ban lifted and trial postponed until 5 November. Abdulhadi continues to serve the life sentence handed down to him in 2011, after playing a prominent role in the country’s pro-democracy protests that year. 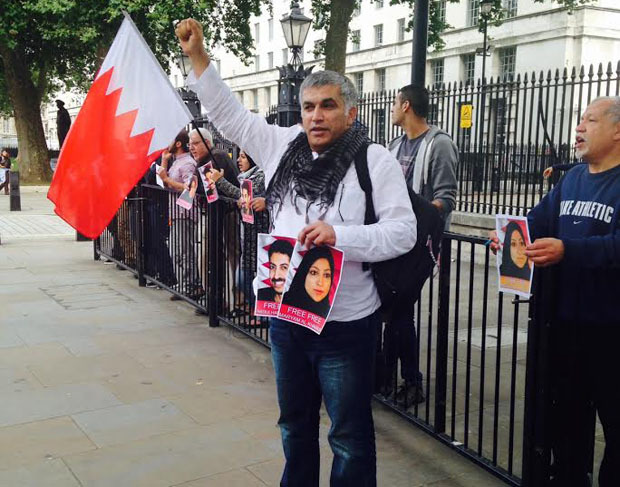 While in London, Rajab told Index about the human rights and free speech situation in Bahrain, saying that “at least 50,000 people” had been in and out of jail in the past three months alone, “just for practising their right to freedom of assembly, freedom of gathering, freedom of expression”. “It is time for Bahrain’s rulers to stop harassing human rights defenders and silencing free speech, and live up to their international obligations – including those they pledged again to uphold as part of the UN Universal Periodic Review just last month. Please, let our colleagues go free. Free Nabeel Rajab and drop the charges facing Rajab and the Al-Khawajas, ” GCHR said in a statement. Correction 10:30, 3 October: Due to a typo, an earlier version of this article used the number “50,0000” instead of “50,000”.